Win 25 Seats of ScreenWatch! Schools and training labs across the country are adding new technology to their classrooms every year. A survey conducted by PBS LearningMedia in 2013 listed teachers as saying ‘technology enables them to reinforce and expand on content (74%), to motivate students to learn (74%), and to respond to a variety of learning styles (73%). Seven in 10 teachers (69%) surveyed said educational technology allows them to “do much more than ever before” for their students.’ With statements like that, it is no wonder that technology is present in the classroom in more ways than ever before. One of the most sought after devices today seems to be the interactive whiteboard. In PBS’s survey, they conclude that nearly 6 in 10 teachers have access to an interactive whiteboards (59%). However, equipping your classrooms and training labs with the latest technology is one thing; ensuring that your teachers have the proper tools to effectively support and manage students can be quite another. Enter SoftLINK, a classroom management software package that enables teachers to use their classroom technology to its fullest potential. SoftLINK’s intuitive interface features a wide array of monitoring, instructional, and assessment tools that have been fully optimized for use with an interactive whiteboard. 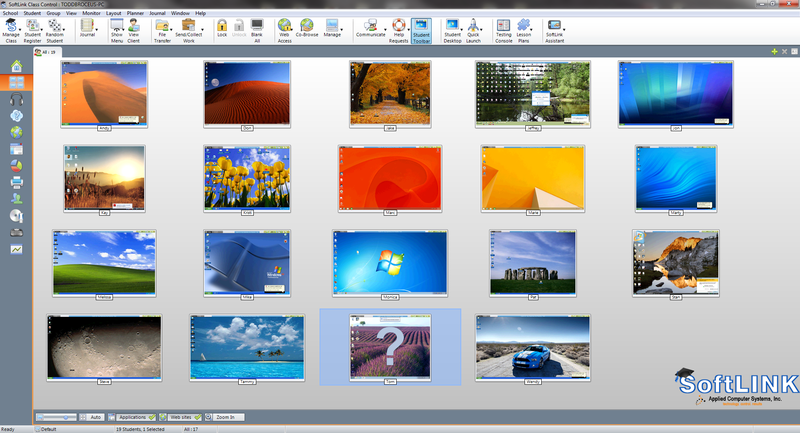 Minimizing SoftLINK’s instructor interface will allow the teacher to display their desktop on the interactive whiteboard for demonstration purposes while still providing a convenient toolbar with access to many of SoftLINK’s key features. SoftLINK offers a variety of options to view screens on the interactive whiteboard. As an example, you can select a student’s screen to display on the whiteboard as well as the remainder of the classroom monitors. You may also choose two or more student’s work to display side by side on the interactive whiteboard to allow for a classroom comparison and discussion. You can even broadcast the display of the interactive whiteboard to each student’s screen by selecting the Show option – giving each student a perfect view! As a teacher, if you find that focusing your students’ attention is a major concern, look no further. SoftLINK provides a quick and easy way for teachers to gain the attention of the class by locking the students’ keyboards and mice at any given time by selecting the Lock option. Likewise, you can simply turn off the student screens by selecting Blank All directing the class’s focus to the front of the class. 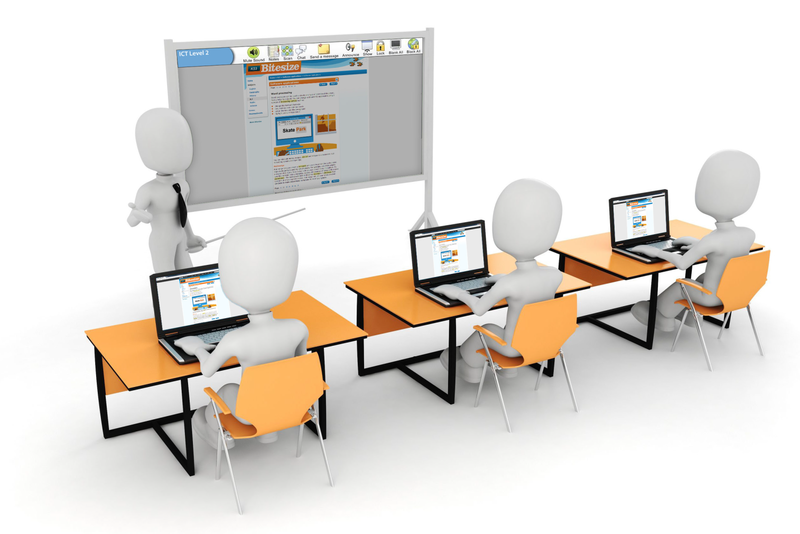 Now you can demonstrate on the interactive whiteboard or even lecture the class, essentially eliminating any distractions the computers may pose. 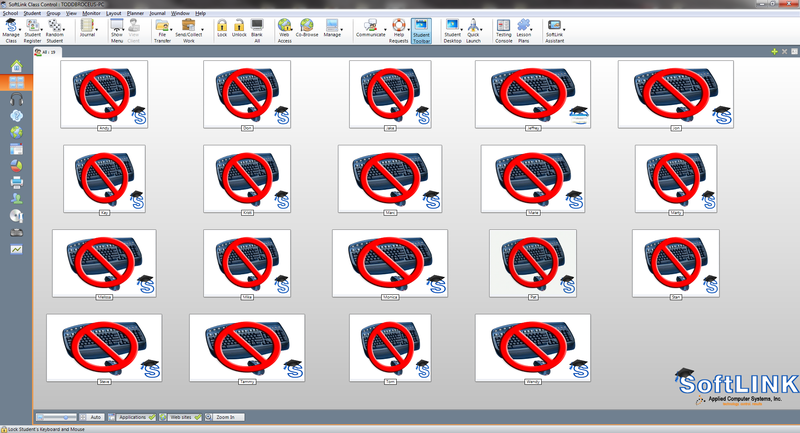 Remove even more distractions during the class by limiting your students’ access to certain applications and websites. SoftLINK provides teachers with the means to easily block selected applications or internet access. While teaching at the interactive whiteboard, use the Tutor Tool Bar to select the Block All icon to block all internet access instantly! Let’s face it, class time is a valuable commodity and it is extremely limited. When your students enter the classroom, it may take five or ten minutes for them to log in and open the appropriate program. 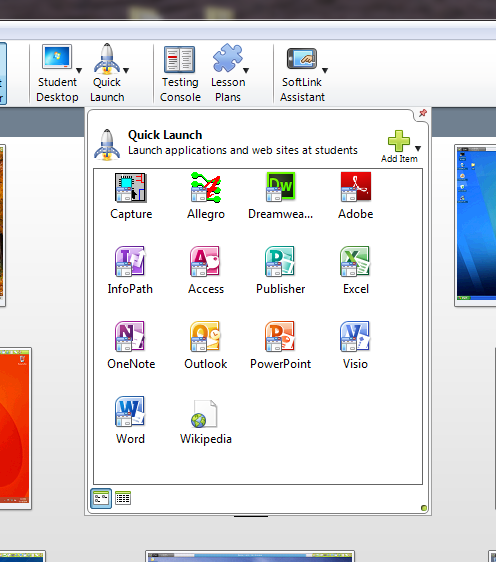 SoftLINK empowers teachers with the Quick Launch icon. The Quick Launch icon provides teachers with the means to launch applications or webpages on all of the student desktops simultaneously. Why wait on your students to get prepared when SoftLINK can get the class started immediately? After the applications and websites are launched, continue your class by explaining the procedure via your interactive whiteboard. Passing out and collecting work used to be an arduous task, but SoftLINK can do the job almost instantly using its enhanced file transfer delivery. After explaining and demonstrating the task objectives on the interactive whiteboard, the teacher can send the task digitally to the students. You, as the teacher, can collect the files back at your leisure. Each file is automatically appended for easy identification with the student’s name, further helping your organize your students’ assignments. It is rather unfortunate, but today teachers must be concerned with selecting students in class. Sometimes students feel as if the teacher is singling them out or “picking” on them. SoftLINK can alleviate this concern. Selecting Random Student from the toolbar will cause the SoftLINK to randomly select a student so that they may answer your question or complete the required task. The result is displayed on the interactive whiteboard for the entire class to see and the subjectivity of the teacher selecting a student is no longer an issue. We all know that some students find it hard to ask for help. Whether they are self-conscious about asking for help or are concerned what the rest of the class might think is irrelevant. As a teacher, you want your students to ask questions when they are uncertain of a topic, but more often than naught, students just hesitate to ask because they think it may be a “dumb” question. SoftLINK provides students a way to discreetly request for help, allowing them to ask questions with confidence, not shame. When a student asks for help, an alert will appear on your instructor’s screen or your interactive whiteboard. 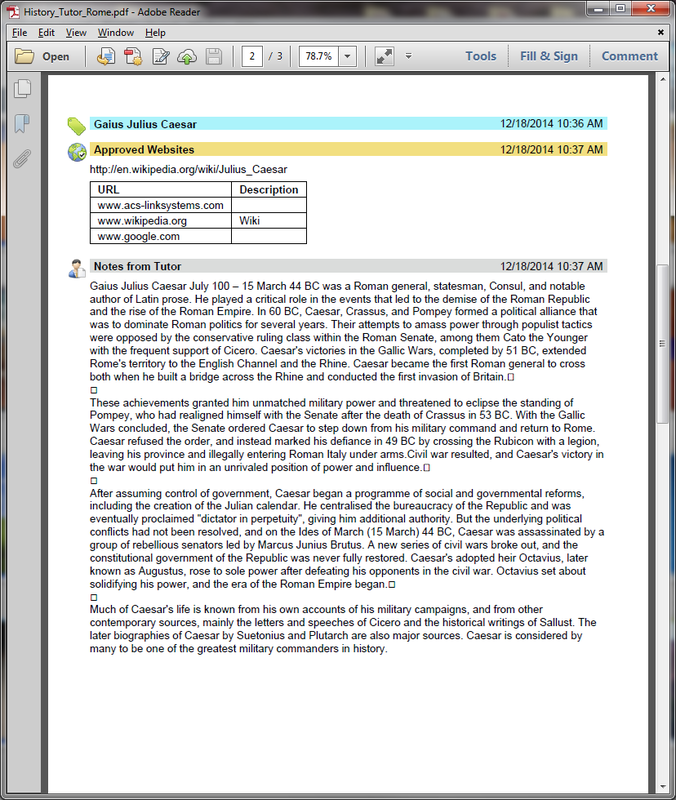 SoftLINK even gives you the ability to create a Journal for each student in the classroom. Any information that is shown on the Interactive whiteboard can be added to the Journal at any time. Along with any content from the whiteboard, teachers can add text, screenshots, pictures, target words, and survey results. The Journal is meant to aid students with their studies, so it also allows students to add their own individual notes to the Journal. This gives each student a fully personalized PDF containing all of the class notes (those added by the teacher) as well as any information they personally added during the class time. SoftLINK is a great addition to any computer-based training classroom. You will be amazed at how SoftLINK will encourage additional collaboration in the classroom. It will become just like your interactive whiteboard, a teaching tool you cannot live without.